An arborist is a specialist trained and educated in the science and art of planting, caring for, and maintaining trees. Informally, an arborist is often called a “tree doctor.” When a tree doesn’t look right, an arborist can determine whether it should be removed or simply trimmed back. Proper tree care is an investment that can lead to substantial returns. When properly cared for, trees add beauty to your property and can add considerable value. On the other hand, poorly-maintained, damaged or diseased trees can fall or drop limbs, and be a significant liability; these trees should be removed before they cause damage or injury to the property or people. In most cases, this is not something homeowners should do themselves. Pruning or removing trees, especially large trees, can be dangerous work and should always be supervised by a certified arborist. Eliminating branches that rub against each other. windows, or that obstruct streets or sidewalks. Removing branches (“thinning”) to increase light penetration. Improving the shape or form of the tree. Considered irreparably hazardous or dangerous. Causing an obstruction that can’t be corrected through pruning. Crowding and causing harm to other trees. To be replaced by a more suitable specimen. Located in an area where new construction requires removal. Storms may cause limbs or entire trees to fall and land on other trees, cars, homes and other structures. A storm-damaged tree can weigh several tons, and be dangerous to remove or trim. 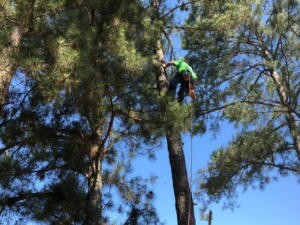 An arborist can assist in performing the job in a safe manner, while reducing further risk of damage to property. The wrong tree planted in the wrong location could lead to future problems as a result of limited growing space, insects, diseases, or poor growth. Our arborist can recommend types of trees that are appropriate for Georgia, and where to plant them on your property. Marietta Tree Service can then do the planting for you. Plant health care and maintenance planning. Tree cabling and bracing for new trees or weak trees. An arborist report is a certified arborist’s formal assessment of the health and condition of a tree(s), or on site conditions affecting the trees or the tree’s canopy. A formal arborist report can only be written by a certified arborist. Arborist reports are used for a variety of purposes. Usually they are commissioned by builders, developers or architects to obtain a permit for the pruning or removal of a tree or multiple trees. The report will describe the condition of the tree(s) and the action needed to correct any defects. Other uses of an arborist report includes personal injury lawsuits, property purchase negotiations, neighbor dispute resolution, insurance claims, and municipal condemnation of hazardous trees. Call Marietta Tree Service today at 770-912-4033 to request an arborist consultation or fill out a contact form.